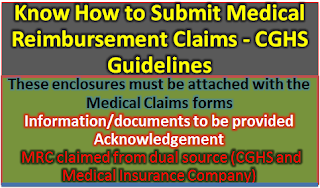 In case of treatment in emergency in non-empanelled hospital/expenditure incurred for treatment in empanelled hospital, Medical Reimbursement Claim (MRC) will have to be submitted by the beneficiary for reimbursement of expenses incurred. The claim is to be submitted to the concerned department by serving employees and to the CMO I/C of the CGHS wellness Centre (where the CGHS card is registered) by the pensioner beneficiary within 3 months of discharge from the hospital. In case of delay in submission of claim beyond 3 months, the reasons justifying the delay must be stated by the beneficiary in a forwarding letter. The claim is to be submitted in duplicate in the prescribed form. Break up of investigations /tests (details of individual tests, number of tests with rates) from hospital. In case partial settlement of claim by any insurance agency, copies of bills duly endorsed by insurance agency, mentioning that original bills have been retained by them and amount of claim settled by the agency, to be submitted. The telephone number and email ID of the beneficiary should invariably be mentioned correctly. The claim is to be submitted at the CGHS wellness Centre where the beneficiary is registered. 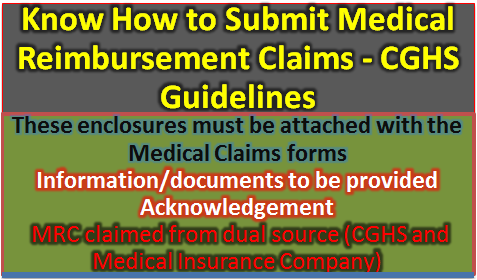 On verification as per checklist if the claim is found to be complete with all documents then an acknowledgement will be generated with a claim number in the computer module of the wellness Centre. The status of the claim can be viewed in the CGHS computer module using the claim number. Particulars of the claims which are more than one month old are now displayed on the CGHS website. In case the beneficiary is also covered under Insurance and the claim has been settled by the Insurance Agency, the liability of CGHS will be reimbursement to the extent of balance of total claim after payment by insurance company subject to the maximum amount of CGHS rate.